Storms are pummeling Texas, Oklahoma, and parts of Arkansas tonight. 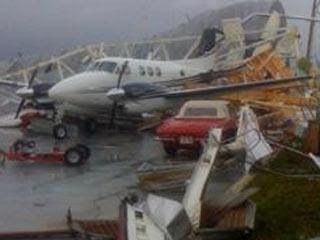 A tornado struck Breckenridge, TX this afternoon damaging their airport and a number of planes. Much of Arkansas will be under the gun overnight. Refresh my page to see the latest weather warnings courtesy of SwiftWX.com. The expectation is for these strong storms to move eastward and begin affecting West Tennessee on Thursday. Here on the Cumberland Plateau, we recorded our third day in a row with temperatures above 70°. Today's high was 71.2°....With tomorrow's high expected to reach into the middle 70's, we should record a fourth day above 70°. March saw just two days above 70°...that was on March 13th and March 19th.